The men in the white suits and masks are not from the Center for Disease Control, but are Leonard and the New Guys (Bud and Jon). 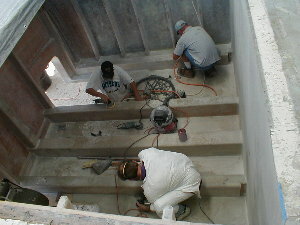 They are undertaking the final faring on the engine room, before it’s painted. 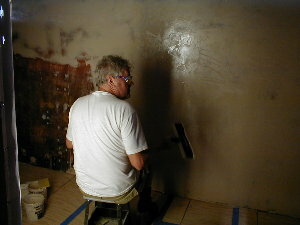 This involves slathering on faring compound, aka putty, and sanding it slick and straight. 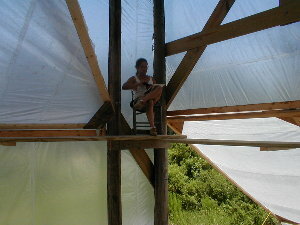 Leonard, who has taken to jumping in the creek during lunch break, reports that they have almost completed this stage. 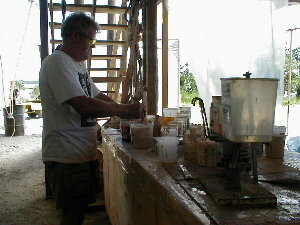 The busiest place at the Cherokee facility these days seems to be the glue station, where epoxy is mixed and faring compound is prepared. 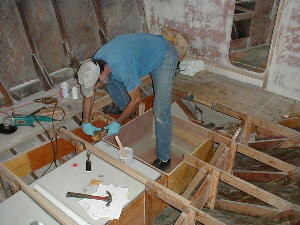 Below, Norm is in the process of placing faring compound on the aft bulkhead of the master stateroom. This will then be board-sanded flat and smooth as, well, board-sanded wood. 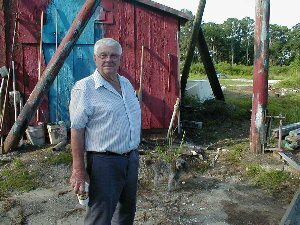 Bill Brown, forever in the septic end of things, has installed the greywater and blackwater tanks. 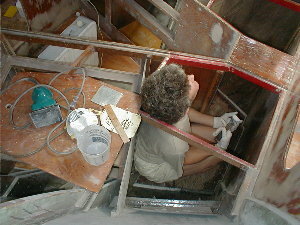 He is also planning the discharge side of the plumbing for sinks and showers, which will be placed beneath the deck toilets. 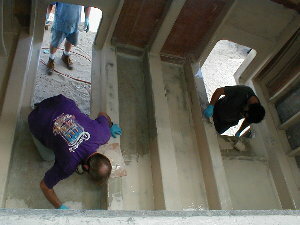 Wall panels of Cherokee’s interior are getting sanded and fared flat while outside of the boat. 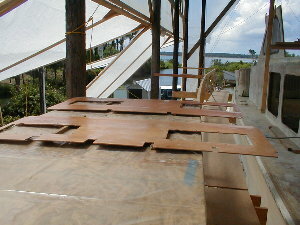 This facilitates production, resulting in faster work and cooler employees. 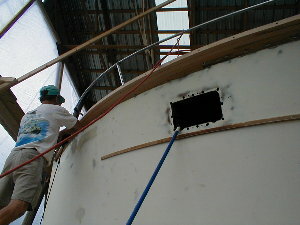 Other exterior work includes Jeff Heyland’s bumper replacement. 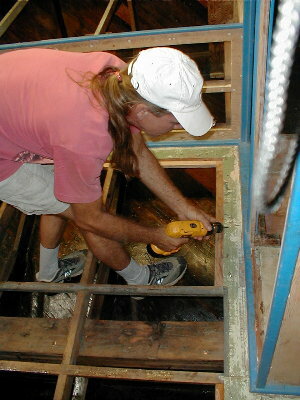 Jim, deep in the interior, is making a perimeter for the aft guestroom floor hatch, which will allow access to the plumbing and air conditioning tubing running from the compressors back into the engine room.